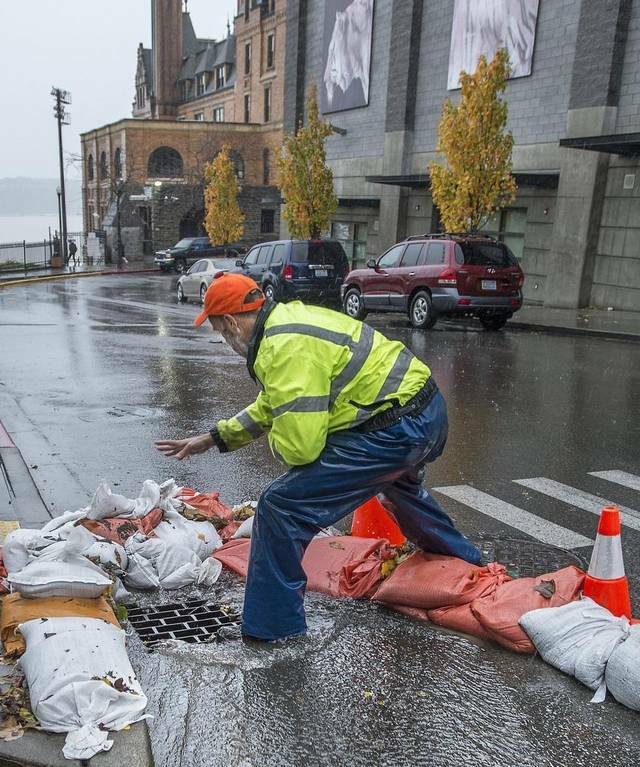 Each year, Tacoma gets about 40 inches of rain, with the potential for about four inches to fall within a 24-hour period during extreme events. When that much rain comes down that fast the City’s stormwater system can get overwhelmed and some City streets and low areas can flood. To report stormwater flooding, sewage backups or street flooding, call (253) 591-5585. What can you do About Street Flooding? If your street is flooding, it is often caused by a catch basin that is covered with leaves, plastic bags or other debris. Use a rake, broom or blower to regularly remove debris from the street catch basin grate near your home or business. With more than 18,000 catch basins to manage, the City can't get to them all during heavy rains. We need your help. If the catch basin in your street is clear and there is still street flooding, call (253) 591-5585. Check your gutters and downspouts and clean them often, before they clog. During heavy rain, gutters collect an incredible amount of water which you will want to redirect away from your home. The water should be redirected at least three to five feet, but ideally, redirect the water all the way to the street or the stormwater system. Visit a home improvement store for additional information on home drainage systems or to learn how to extend a downspout yourself. What can you do with Leaves? Leaves can be used as compost in your garden. Place leaves in your brown yard/food waste container for pickup. Take leaves and yard waste to the Tacoma Recovery and Transfer Station located at 3510 S. Mullen Street, Tacoma, WA 98409 (no additional fee for City of Tacoma residential customers). Please keep loads covered. What are your Responsibilities as a Homeowner? Drainage systems on private property are the owner's responsibility. Be sure to maintain your gutters and downspouts. It's also important to remove root blockages and fix damaged pipes on your property. Rake up leaves so they don't clog the catch basins in the street. Your neighbors will thank you. What are the City's Responsibilities? The City maintains more than 500 miles of stormwater pipe and 18,000 catch basins as well as pump stations and regional flood control facilities. When excessive rain causes flooding, the City often responds to flooding complaints and cleans out clogged catch basins. Does the City Cover Flood Damages? In most cases, the City does not cover flood damages. Excessive rain is considered an "act of God" and the City is not responsible for damages resulting from these events. Check with your insurance company for details on your homeowner's policy. If your home has flood damage, make sure to track your losses and costs in case your insurance will cover repairs. Does the City Cover Flood Damages if the City's Stormwater System Fails? A stormwater system that is overburdened by too much rain is not considered a failed system. However, if flooding is caused by a failure in the City stormwater system itself, you could be entitled to reimbursement for all or part of your expenses directly related to the flood damage. Most often, residential flooding problems are related to lack of maintenance with roof downspouts or driveway drains. It's important to regularly clean gutters, remove root blockages and fix damaged pipes on your property. How do I File a Claim for Stormwater Damages? If you wish to file a claim for stormwater damages, request a claim form by calling the City's Source Control Office at (253) 591-5588. A claims representative will investigate your case. In the case of an emergency situation, remember that City employees are working overtime and will address your problem as quickly as possible. Please keep all your receipts and log any personal time taken to clean up. Do not discard any personal property you intend to claim until your claims representative documents the property and instructs you to do so. What About Electricity and Floodwater? If floodwater reaches your outlets or appliance connection, turn off power to the flooded areas if you can safely reach the electrical panel. You might also want to turn off gas to individual appliances if you can safely do so. If you are unable to turn off electricity and the water is above the electrical outlets, wait until the water has receded to enter the area. It is your responsibility to prevent further damage to your property during and after a flood. Prolonged dampness can cause significant, irreversible harm, and no reimbursement is made for damage that occurs as a result of inaction. Molds form quickly in dampness. It is imperative that wet areas are cleaned and completely dried as quickly as possible. Undamaged items should be removed from the wet area to protect them and to make cleaning easier. You may hire a professional cleaning service or do the work yourself. If you hire a professional cleaning service, we recommend that you choose one that is experienced in water damage response. You will find a full listing of professional cleaning services in the Yellow Pages under "Fire and Water Damage Restoration." Wear rubber gloves and shoes. Pumps, wet/dry shop vacuums, buckets, sandbags and floor drain plugs will all help remove or contain the water. Avoid tracking water from flooded areas into other parts of your home. Wash your hands with soap and water after working in flooded areas. Dry the area and personal property thoroughly using a reliable heat source or by renting a dehumidifier. Remove undamaged items from the area. Be careful not to put wet and dry items together. Extract water from any carpet so you can lift it up and remove the wet padding underneath. If the carpet is in good condition, it can often be cleaned and dried in place or taken to a carpet cleaner for service. However, padding should usually be removed and discarded. Try not to allow wet clothing or linens (both machine-wash and dry-clean items) to sit for more than 24 hours before cleaning. Materials such as concrete, unfinished wood or metal that will not be damaged by chlorine bleach can be sanitized with a solution of ten percent household bleach in water (one cup of bleach for every ten cups of water). Please be cautious when using this solution. It is not appropriate for use on fabrics, leather, or other materials that will be affected by bleach.